Albert William "Al" Kaline (/ˈkeɪlaɪn/; born December 19, 1934), nicknamed "Mr. Tiger", is an American former Major League Baseball right fielder. He is a member of the Baseball Hall of Fame. Kaline played his entire 22-year baseball career with the Detroit Tigers. For most of his career, Kaline played in the outfield, mainly as a right fielder where he won ten Gold Gloves and was known for his strong throwing arm. He was selected to 18 All-Star Games and was selected as an All-Star each year between 1955 and 1967. Near the end of his career, Kaline also played as first baseman and, in his last season, was the Tigers' designated hitter. He retired not long after reaching the 3,000 hit milestone. Immediately after retiring from playing, he became the Tigers' TV color commentator, a position he held until 2002. Kaline still works for the Tigers as a front office official. Kaline was born and raised in Baltimore, Maryland. His family was poor. Several relatives played semi-pro baseball, but no one in his family had graduated from high school. When he was eight years old, Kaline developed osteomyelitis and had a segment of bone removed from his left foot. The surgery left him with scarring and permanent deformity, but he was an outstanding pitcher in youth baseball. Kaline had learned to throw a fastball, changeup and curveball by the age of nine. He attended Baltimore's Southern High School, where he starred in basketball and also played football until he sustained a cheek injury. When he tried out for the baseball team, there was no room on the pitching staff so Kaline moved to the outfield. He earned all-state honors in baseball all four years. Kaline said that he was a poor student but that he was well liked by his teachers. He said that his teachers passed him and that they believed he would become a baseball player. Kaline bypassed the minor league system and joined the Tigers directly from high school as an 18-year-old "bonus baby" signee, receiving $35,000 (equivalent to $310,081 in 2015), to sign with the team. He made his major league debut on June 25, 1953 in Philadelphia as a late-inning replacement for outfielder Jim Delsing. Kaline wore number 25 during his rookie campaign, but asked teammate Pat Mullin for his No. 6 after the 1953 season ended. Kaline wore the number for the rest of his major league playing career. He was known simply as "Six" in the Tiger clubhouse. In 1955, at age 20, Kaline ended the season with a .340 batting average, becoming the youngest player ever to win the American League batting title. No 20-year-old major league player had won a batting title since Ty Cobb in 1907. During the 1955 season, Kaline became the 13th man in major league history to hit two home runs in the same inning, became the youngest to hit three home runs in one game, and finished the year with 200 hits, 27 home runs and 102 RBIs. He also finished second to Yogi Berra in the American League's 1955 Most Valuable Player Award voting. He was selected to the Major League Baseball All-Star Game, the first in a string of consecutive All-Star selections that lasted through 1967. Kaline followed in 1956 with a .314 batting average with 27 home runs and 128 RBIs. He led the league in outfield assists with 18 in 1956 and again in 1958 with 23. Kaline was out for several games in 1958 after he was hit by a pitch. He missed several games in 1959 after he was hit by a thrown ball and sustained a fracture in his cheekbone. Kaline had been knocked out from the blow and initial speculation was that he could miss six weeks of the season. In 1961, Kaline hit .324 to finish second in the AL batting race (behind teammate Norm Cash). The Tigers won 101 games, to date the third-highest win total in team history, but still finished eight games behind a New York Yankees team that was led by the home run heroics of Roger Maris and Mickey Mantle. Kaline began the 1962 season hitting .345 with 13 HR and 38 RBI in 35 games. On May 28 of that season, he sustained a broken collarbone while making a game-ending catch on a ball hit by New York's Elston Howard. He missed 57 games due to the injury and Detroit was unable to seriously compete for a pennant due to his absence. By late March 1963, Kaline said that he felt good and he was hitting .373 in 53 spring training at-bats. In the 1963 regular season, Kaline hit .312 with 27 home runs and 101 RBI, finishing second to Howard in the American League's Most Valuable Player Award voting. 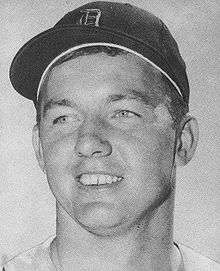 Kaline experienced pain in his left foot, the one that had been affected by osteomyelitis as a child, throughout the 1964 season. His batting average dropped to .293 that season. Kaline tried to ignore the pain, but he saw physicians who thought he was suffering from gout and administered injections. Still in pain the following season, Kaline saw an orthopedic surgeon who prescribed corrective shoes. "I feel so much better than I did before, that it's ridiculous", Kaline said by June 1965. Sportswriter Milton Gross described Kaline's deformed foot, saying, "The pinky and middle finger don't touch the ground. The fourth toe is stretched. The second and third are shortened. The first and third toes overlap the second and the fourth is beginning to overlap the big toe, which has begun to bend to the left. It is hard to believe, but for all of his career with the Tigers while he has been called the perfect player, Kaline has bordered on being a cripple." In the summer of 1967, the normally calm Kaline broke a bone in his hand when he struck a baseball bat against a bat rack. Kaline missed a month of play. When he returned, the Tigers were in a four-team pennant race, but the team finished a game out of first place. Kaline missed two months of the 1968 season with a broken arm, but he returned to the lineup when Tiger manager Mayo Smith benched shortstop Ray Oyler and sent center fielder Mickey Stanley to play shortstop to make room for Kaline in the outfield. ESPN later called Smith's move one of the ten greatest coaching decisions of the century. In the 1968 World Series, the St. Louis Cardinals won three of the first four games of the series and were leading Game 5 by a score of 3–2 in the seventh inning, when Kaline hit a bases loaded single to drive in two runs. The Tigers won that game, and the two games following it, for their first world championship since 1945. In his only World Series appearance, Kaline hit .379 with two home runs and eight RBI in seven games. For their victory, Kaline and his teammates each received bonus checks of $10,000 (at a time when Kaline's salary was "about 70,000"). In 1970 Kaline was nearly a victim of a freak accident on the baseball field. On May 30, 1970, in a game at Milwaukee's County Stadium, Kaline collided with center fielder Jim Northrup as they both pursued a flyball. Kaline fell to the warning track injured. Alertly, left fielder Willie Horton rushed over and quickly recognized that Kaline was turning blue. Horton reached in and cleared Kaline's airway, saving his life. After hitting .294 in 1971, Kaline became the first Tiger to sign a $100,000 contract. He had turned down a pay raise from $95,000 to $100,000 the previous year, saying he did not feel like he deserved it after hitting .278 with 21 home runs in 1970. Detroit contended all season for the 1972 pennant, trailing the Red Sox by a half-game before a series against them to end the regular season. Kaline batted eight times in two games, registering five hits and three runs scored. Detroit won those first two games and clinched the AL East pennant. They lost the ALCS to the Oakland Athletics that year after Reggie Jackson stole home in the final game of the series. In March 1973, Kaline won the Roberto Clemente Award in recognition of the honor he brought to baseball on and off the field. On September 24, 1974, Kaline became the 12th player in MLB history to reach the 3000 hit plateau, when he hit a double off the Orioles' Dave McNally. After reaching the milestone, he announced that he would retire. "I'm glad it's over. I really am. I don't think I'll miss it. I may miss spring training", Kaline said after his last game on October 3. He finished his career with 3,007 hits (25th on the all-time list), 399 home runs (a Tigers record and 43rd on the all-time list), 1622 runs scored, and 1582 RBIs. He batted over .300 nine times in his career to finish with a lifetime batting average of .297, and while never considered a true power hitter, he hit 25 or more home runs seven times in his career. Al Kaline's number 6 was retired by the Detroit Tigers in 1980. Kaline was elected to the Baseball Hall of Fame in 1980, becoming the tenth player in history to be inducted in his first year of eligibility. Kaline was named on 340 of the 385 ballots (88.3%) cast by sportswriters. Kaline and Duke Snider were the only candidates elected by the sportswriters in 1980. Kaline later said, "I really never thought I would choose an individual thing that happened just to me over a team thing like the World Series. But I would have to say this is the biggest thing that has ever happened to me. Kaline was honored by the Tigers as the first of their players to have his uniform number (6) retired. Versatile and well-rounded, he won ten Gold Glove Awards (1957–59 and 1961–67) for excellence in the field and appeared in the All-Star game for fifteen seasons (1955–67, 1971, 1974). In 1998, he ranked Number 76 on The Sporting News list of the 100 Greatest Baseball Players, and was nominated as a finalist for the Major League Baseball All-Century Team. Cherry Street, which ran behind the left-field stands at Tiger Stadium, was renamed Kaline Drive in his honor. Later that year, on September 27, 1999, when the team played its last game at Tiger Stadium against the Kansas City Royals, Kaline was invited to appear in uniform and present the last lineup card to the umpires. He did so along with George Brett, considered one of the greatest players ever for the Tigers' opponents that day. Kaline was regarded as a well-rounded player by his contemporaries. Baltimore Orioles third baseman Brooks Robinson said of him, "There have been a lot of great defensive players. The fella who could do everything is Al Kaline. He was just the epitome of what a great outfielder is all about – great speed, catches the ball and throws the ball well." Manager Billy Martin once said, "I have always referred to Al Kaline as 'Mister Perfection'. He does it all – hitting, fielding, running, throwing – and he does it with that extra touch of brilliancy that marks him as a super ballplayer... Al fits in anywhere, at any position in the lineup and any spot in the batting order." 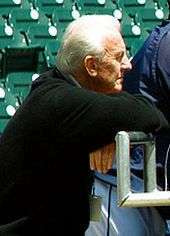 After his playing career, Kaline lived in the Detroit area, and he has remained active within the Tigers organization, serving first as a color commentator on the team's television broadcasts (1975–2002) mostly with play by play announcer and former Tiger and fellow Hall of Famer George Kell, and then later as a consultant to the team. Since 2003, Kaline has served as a special assistant to Tigers President/CEO/General Manager Dave Dombrowski, and his duties include coaching/mentoring outfielders during spring training. Former Tigers teammate Willie Horton also holds this position, and the two threw out the first pitch of the 2006 World Series at Comerica Park. The 2016 campaign will mark Kaline's 64th season with the Tigers as a player, broadcaster or front-office official, one of the longest tenures with one MLB club of anyone in history. Because of his lengthy career and longtime association with the Tigers organization, Kaline's nickname is "Mr. Tiger." Kaline's grandson Colin was selected by the Tigers in the 25th round of the 2007 MLB draft. He did not sign, choosing to play baseball at Florida Southern College. The team drafted him again in the 2011 MLB draft, this time in the 26th round. He played in the low minor leagues with the Detroit organization in 2011-12. 1 2 3 4 5 6 7 8 9 "Al Kaline Statistics and History". baseball-reference.com. Archived from the original on June 29, 2011. Retrieved August 7, 2011. 1 2 3 "Al Kaline biography". National Baseball Hall of Fame and Museum. Archived from the original on July 17, 2011. Retrieved August 7, 2011. ↑ "Al Kaline". The Baseball Page.com. Archived from the original on August 7, 2011. Retrieved August 7, 2011. ↑ "Al Kaline – Special Assistant to the President". Detroit Tigers. Archived from the original on August 7, 2011. Retrieved August 7, 2011. 1 2 Olsen, Jack (May 11, 1964). "The Torments of Excellence". Sports Illustrated. Retrieved April 20, 2013. 1 2 Pattison, Mark, Raglin, David. "Al Kaline". Detroit Tigers 1984: What a Start! What a Finish!. Society for American Baseball Research. p. 217. ISBN 1933599456. Retrieved January 9, 2014. ↑ Official Profile, Photo and Data Book. Detroit Tigers. 1957. p. 29. ↑ "Tigers Pay $95,000 Bonus Money For School Hurler and Outfielder". The New York Times. June 23, 1953. Retrieved October 2, 2008. ↑ "Two home runs in one inning". Major League Baseball. Archived from the original on August 7, 2011. Retrieved August 7, 2011. ↑ "Baseball Awards Voting for 1955". Baseball-Reference.com. Retrieved August 7, 2011. ↑ "1956 American League Fielding Leaders". Baseballreference.com. Retrieved August 7, 2011. ↑ "1958 American League Fielding Leaders". Baseball-Reference.com. Retrieved August 7, 2011. 1 2 Rathet, Mike (March 28, 1963). "Al Kaline is Back in Groove". Ellensburg Daily Record. Retrieved September 15, 2013. ↑ "Baseball Awards Voting for 1963". Baseball-Reference.com. Retrieved August 7, 2011. 1 2 3 "Al Kaline: "Crazy Toes"". Evening Independent. June 3, 1965. Retrieved September 15, 2013. ↑ "Al Kaline Breaks Hand in Fit of Temper". The Miami News. June 28, 1967. Retrieved September 16, 2013. 1 2 "Al Kaline: Prince of Detroit Reaches His Promised Land". St. Petersburg Times. September 25, 1974. Retrieved September 15, 2013. 1 2 3 4 5 Waddell, Nick. "The Baseball Biography Project: Al Kaline". Society for American Baseball Research. Retrieved May 3, 2010. ↑ "Greatest coaching decisions". ESPN. Archived from the original on July 17, 2011. Retrieved August 7, 2011. ↑ "1968 World Series Game 5 box score at Baseball Reference". Baseball-Reference.com. Retrieved 2013-12-26. ↑ "1968 World Series at Baseball Reference". Baseball-Reference.com. Retrieved 2013-12-26. ↑ Waldstein, David (5 October 2014). "Postseason Paychecks Are All About Sharing". The New York Times (56645). Retrieved 5 October 2014. ↑ Dow, Bill (May 27, 2015). "The Day Willie Horton Saved Al Kaline's Life". Detroit Athletic Co. blog. Archived from the original on June 13, 2015. ↑ "Al Kaline Lands $100,000 Contract". Toledo Blade. December 20, 1971. Retrieved October 31, 2013. ↑ "Boston, Detroit Start Series for Pennant". Sumter Daily Item. October 2, 1972. Retrieved October 31, 2013. ↑ "The 1972 DET A Regular Season Batting Log for Al Kaline". Retrosheet. Retrieved October 31, 2013. ↑ "The 1972 Detroit Tigers Regular Season Game Log". Retrosheet. Retrieved October 31, 2013. ↑ "4 Managers Out, 2 Back". Milwaukee Journal. October 6, 1972. Retrieved October 31, 2013. ↑ Snyder, Matt (October 4, 2013). "VIDEO: When Reggie Jackson stole home in A's-Tigers ALCS game". CBS Sports. Retrieved October 31, 2013. ↑ "Al Kaline honored". Leader-Post. March 21, 1973. Retrieved October 31, 2013. ↑ "3000 hit club at the Baseball Hall of Fame". Exhibits.baseballhalloffame.org. September 24, 1974. Archived from the original on July 25, 2015. Retrieved 2013-12-26. ↑ "September 24, 1974 Tigers-Orioles box score at Baseball Almanac". Baseball-almanac.com. Retrieved 2013-12-26. ↑ "September 24, 1974 Tigers-Orioles box score at Baseball Reference". Baseball-Reference.com. Retrieved 2013-12-26. ↑ "Al Kaline finishes great career in dugout". Ottawa Citizen. October 3, 1974. Retrieved September 16, 2013. ↑ "Al Kaline – the Detroit Tigers' 'Mr. Perfection'". Archived from the original on January 14, 2013. Retrieved 2013-12-26. ↑ "Detroit Tigers retired numbers at mlb.com". Mlb.mlb.com. Retrieved 2013-12-26. ↑ "Gold Glove Award winners at Baseball Reference". Baseball-Reference.com. 2009-01-01. Retrieved 2013-12-26. ↑ Al Kaline at The Sporting News 100 Greatest Baseball Players Archived February 27, 2009, at the Wayback Machine. ↑ "Al Kaline at The Major League Baseball All-Century Team". Mlb.mlb.com. 2013-05-24. Retrieved 2013-12-26. ↑ Gage, Tom. "Tigers 'lifer' Al Kaline stays in background but still commands attention." Detroit News, February 23, 2011. ↑ "Six: A Salute to Al Kaline". Detroit Tigers. Archived from the original on August 7, 2011. Retrieved August 7, 2011. ↑ "Colin Kaline, 3b, Tigers". Baseball America. Retrieved February 2, 2014. Hawkins, Jim (2010). Al Kaline: The Biography of a Tigers Icon. Triumph Books. Wikimedia Commons has media related to Al Kaline.